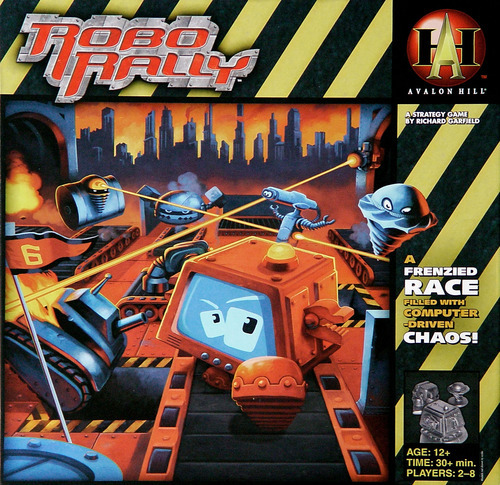 Richard Garfield, designer of such classic games as Magic: The Gathering and King of Tokyo, is working with Hasbro to re-release his robot-programming game Robo Rally. In 2014 Garfield posted on the Geek that he was considering what changes he would make to the game with 20 years of design experience behind him. "To summarize the effects of the changes - the game plays faster, has less downtime, is a bit crazier, and has more option card influx." We have no idea if those changes were actually incorporated into this new version. At first glance, it looks like they've made the boards smaller--10 x 10 rather than the old versions' 12 x 12. Presumably, this is so they can make the box into a standard size that will fit on store shelves. The old box was slightly bigger than standard size, so it was kind of a pain to fit it on a shelf. It looks like the game will play 2-6 players, be available late summer, and have an MSRP of $40. What are your thoughts on this reprint? Thanks for reading!